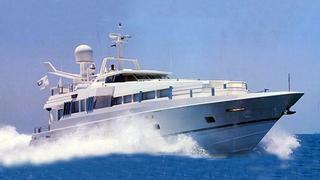 Thom Conboy at Merle Wood & Associates tells me that he has signed the 31.08m Oceanfast motor yacht Gazelle for sale. Built by the Australian yard in 1989 to a design by Phil Curran, she has an aluminium and composite superstructure and teak decks. She was refitted earlier this year. Her Jon Bannenberg interior can accommodate 6 guests in 3 cabins. She cruises at 22 knots and has a top speed of 27 knots. Currently lying in Fort Lauderdale, Gazelle is asking $2.9 million.